Main objective of this report is to identify the major products of General banking practiced and and Investment Activities by Al-Arafah Islami Bank, Dhanmondi Branch and its competitive performance from the year 2007 to 2008. Report also focus on to know about Islami banking system in our country and to focus features and conditions of general banking products Al-Arafah Islami Bank. Finally draw SWOT analysis and make recommendation. The perception of Islamic banking has been bloomed from the inspiration of building up a society on justice in accordance with basic socio-economic principles of Islam. The difference between Islamic bank and conventional bank is on principles. The functions of this type of bank are completely different. This bank is established on Islamic Shariah and all types of transactions are free from interest. Justified profit is the basis of financial transaction of this bank. This bank is committed to establish socio-economic justice. The second Islamic Bank of the country, Al-Baraka Bank Bangladesh Limited commenced banking business as a scheduled Islamic bank on May, 20, 1987. A group of established, dedicated and pious personalities of Bangladesh are the architects and directors of the Bank. Among them a noted Islamic scholar, economist, writer and ex-bureaucrat of Bangladesh government Mr. A.Z.M Shamsul Alam is the founder chairman of the bank. His progressive leadership and continuous inspiration provided a boost for the bank in getting a foothold in the financial market of Bangladesh. Al-Arafah Islami Bank Ltd. has 68 branches and a total of 1432 employees (as of April 2009). Its authorized capital is Taka 2800 million and the paid-up capital is BDT 1748.18 million. To identify the major products of General banking practiced by Al-Arafah Islami Bank Ltd., Dhanmondi Branch and its competitive performance from the year 2007 to 2008. To know about Islami banking system in our country. To know about Al-Arafah Islami Bank Limtied. To identify the major products of Al-Arafah Islami Bank Ltd.
To understand the General Banking and Investment products used by the Dhanmondi Branch of Al-Arafah Islami Bank Ltd.
To focus features and conditions of general banking products Al-Arafah Islami Bank Ltd.
To make a bridge between the theories & practical procedures of banking day-to-day operations. A certain methodology was followed in order to fulfill the objectives of the report, making maximum utilization of the scopes and to avoid the limitations as much as possible to prepare the final outcome of this report. To prepare this report I mostly depend on the experience and secondary information because as an intern it was difficult for me to collect primary information. I used some documents of Al-Arafah Islami Bank Ltd. like; annual reports, product brochures, Dhanmondi Branch statement of affairs, Dhanmondi Branch monthly reports, etc as the secondary source of information. In analyzing these data, I used MS-excel to classify the data and locate the pattern to sort out the data under different head and criteria. The statistical tools are used for in-depth ratio analysis. Introduction to Al-arafah Islami Bank Ltd.
Al-Arafah Islami Bank Ltd. is a banking company incorporated in the People’s Republic of Bangladesh with limited liability. Islamic ideology encourages us to succeed in life here& hereafter. With the objective of achieving success here & hereafter by pursuing the way directed by Allah and the path shown by His Rasul (SM), Al Arafah Islami Bank Ltd was established (registered) as a private limited company on 18 June 1995. The inaugural ceremony took place on 27 September 1995. The authorized capital of the Bank is Tk.2500.00 million and the paid up capital is Tk. 1153.18 million as on 31.12.2007. Renowned Islamic Scholars and pious businessmen of the country are the sponsors of the Bank. 100% of paid up capital is being owned by indigenous shareholders. The equity of the bank stood at Tk. 2037.50 million as on 31 December 2007, the manpower was 1033 and the number of shareholders was 12013. It has achieved a continuous profit and declared a good dividend over the years. High quality customer service through the integration of modern technology and new products is the tool of the bank to achieve success. The bank has a diverse array of carefully tailored products and services to satisfy customer needs. The Bank is committed to contribute significantly to the national economy. It has made a positive contribution towards the socio economic development of the country with 47 branches of which 17 is AD throughout the country. Islam provides us a complete lifestyle. Main objective of Islamic lifestyle is to be successful both in our mortal and immortal life. Therefore in every aspect of our life we should follow the doctrine of Al-Qur’an and lifestyle of Hazrat Muhammad (Sm.) for our supreme success. Al-Arafah Islami Bank started its journey in 1995 with the said principles in mind and to introduce a modern banking system based on Al-Qur’an and Sunnah. A group of established, dedicated and pious personalities of Bangladesh are the architects and directors of the Bank. Among them a noted Islamic scholar, economist, writer and ex-bureaucrat of Bangladesh government Mr. A.Z.M Shamsul Alam is the founder chairman of the bank. His progressive leadership and continuous inspiration provided a boost for the bank in getting a foothold in the financial market of Bangladesh. 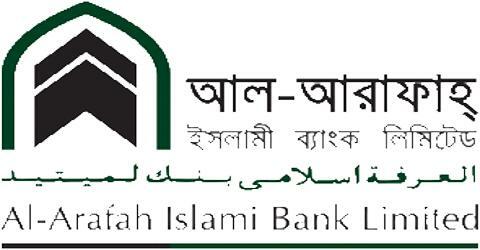 A group of 13 dedicated and noted Islamic personalities of Bangladesh are the member of Board of Directors of the bank. They are also noted for their business acumen. Al-Arafah Islami Bank Ltd. has 53 braches and a total of 1080 employees (upto December 2008). Its authorized capital is Taka 2500 millions and the paid-up capital is Taka 1153.18 millions. Wisdom of the directors, Islamic bankers and the wish of Almighty Allah make Al-Arafah Islami Bank Ltd. most modern and a leading bank in Bangladesh. Achieving the satisfaction of Almighty Allah both here and hereafter. Fast and efficient customer service . Steady and competitive return on shareholders’ equity. All activities of AIBL are conducted under an profit/loss based system according to Islamic Shariah to get the nation rid of Usury. Its investment policies under different modes are fully Shariah compliant and well monitored by the board of Shariah Council. During the year 2007, 70% of the investment income has been distributed among the Mudaraba depositors. In 2008, AIBL has included online banking in its wide range of services. Bangladeshi software has been introduced in this feature to promote the local developers. AIBL regularly arranges its AGMs (Annual General Meeting). Whenever needed EGMs (Extraordinary General Meeting) are also arranged. We regularly pay dividend to our valued shareholders. For the year of 2008, we declared 30% bonus dividend to our shareholders. We believe in providing dedicated services to the clients imbued with Islamic spirit of brotherhood, peace and fraternity. The Bank upholds the Islamic values of establishment of a justified economic system through social emancipation and equitable distribution of wealth. Following the Islamic traditions, it is assisting in the economic progress of the socially deprived people; in the creation of employment opportunities and in promotion of rural areas to ensure a balance development of the country. The Bank believes in social and philanthropic activities and has established AIBL English Medium Madrasha and AIBL Library. More endeavors will inshallah follow in future. Al-Arafah Islami bank is one of the most disciplined Banks with a distinctive corporate culture based on Islami Shariah. Here they believe in shared meaning, shared understanding and shared sense making. The people in this bank can see and understand events, activities, objects and situation in a distinctive way. They mould their manners and etiquette, character individually to suit the purpose of the Bank and the needs of the customers who are of paramount importance to the bank. The people in the Bank see themselves as a tight knit team/family that believes in working together for growth. The corporate culture has developed has not been imposed; it has rather been achieved through their Corporate conduct. The bank has a foundation launching philanthropic activities. Al-Arafah English Medium Madrasah and Al-Arafah Islami Bank Staff Welfare Fund are the major two wings for launching philanthropic activities. The Bank always kept a careful eye on the economic security and benefit of its staffs & officers. The Bank operates a contributory provident fund, a social security & benevolent fund and a gratuity fund for its employees. In the year 2007 Tk. 7.5 lac was paid to wife of late Mr. Shahidul Islam, AVP & former branch manager of Joydevpur Branch from bank’s social security & benevolent fund. Till now a total of Tk. 30 lac has been paid from the fund to the families of late officers & staffs of the bank. Al-Arafah English Medium Madrasah has been established by the Al-Arafah Bank Foundation with a view to building next generation according to the ideals of peace and equality of Islam and to establishing banking and other aspects of life in the way of Islam. The prime aim of this madrasah is to contribute towards building human resource and in the broader sense to ensure human welfare. With the view Al-Arafah Islami Bank Foundation has established an English Medium Madrasah at Dhanmondi in 1999. Such institution upto ‘O’ level of its kind is for the first time in Bangladesh. Library is the carrier and reservoir of knowledge. Al-Arafah Islami Bank has shown that other than generating profit, it can also contribute significantly in the field of providing good source of knowledge by establishing a public library at 32, Topkhana Road, Chittagong Bhaban (1st floor), Dhaka, thus strengthening social development. It is placed in sound, healthy surroundings. It harbours 23,000 books of reference for the researchers, students, professionals, bankers, physicians, engineers, politicians, writers or journalists, even for the kids. It is open to all from the year 2000 and well located & accessible to everybody. It procured some exceptional collection of books on Religion, Economics, Banking, Computer Science, Business Administration, Sociology, English & Arabic language and juvenile literature in Bangla, English, Urdu & Arabic which are very rare. Varieties of good books were procured in the library, but those were predominantly to enrich Islamic knowledge and culture. To fulfill that goal Al-Arafah Islami Bank distributed a total of 1084 copies of Arabic-BangIa ‘Torjomatul Quran’ to all the upazillas of the country. Education is the harmonious development of body, mind & soul. If religion is not attached to it the real attitude towards life and values will fail to develop. It is mandatory to learn Elm-e-Din to govern our life in the right way of Islam. To fulfill this noble intention Al-Arafah Islami Bank Library started Dars-ul-Quran (Teachings of Quran) program. This program will cover translation with detail explanation of Quran starting from Sura Fatiha upto Sura Nas gradually. Dars-ul-Quran program takes place every monday after Magrib prayer. Other than this Al-Arafah Islami Bank Library arranges shows of feature films or documentary films on Islamic life & culture. Dhanmondi Branch was started in 15th December, 1998; to cover the huge and prospective customers from the area of Dhanmondi, Zigatola, Hagaribagh, Rayerbazar Satmasjid Road. It was estimated by them that there are numbers of saver and borrower groups those who are willing to have their economic services through an Islamic bank. Being the second Islamic bank of the country under Al-Arafah Islami Bank Ltd. opened the Dhanmondi Branch, as their 17th branch at Satmasjid Road, Dhanmondi, Dhaka. Now, there are twenty two employees. It is a non-ad branch. Which means it doesn’t directly deal with the foreign exchange transactions. It has a large office floor which can accommodate good number of customers comfortably. The branch has efficient human resources that can meet up customer’s needs. Order wise work load is distributed properly. Besides, interpersonal relationship is remarkable. Most noted strength is customer service. The most vital and important section of the branch is Cash Department. It deals with all kinds of cash transactions. This department starts the day with cash in vault. Each day some cash that is opening cash balance are transferred to the cash officers from the cash vault. Opening cash balance is adjusted by cash receipts and payments. This figure is called closing balance. This balance is then added to the vault. This is the final cash balance figure for the bank at the end of any particular day. There is an important clause and duty practiced by the branch is to refund the principal amount that exceeds more than Tk. 1 crore at the principle branch of the bank. Vault Register: It keeps account of cash balance in vault in the bank. Cash Receipt Register: Cash receipt in whole of the day is recorded here. Cash Payment Register: Cash payments are made in a day are entered here. Cash Balance Book: Balance here is compared with vault register. If no difference is found, indicates no error. Receiving filled up application in bank’s prescribed form mentioning what type of account is desired to be opened. Cheques clearing section of Al-Arafah Islami Bank Ltd. receives cheque, demand drafts and pay orders of their clients. Upon the receipt of the instrument the cheque clearing section examines three types of payment modules. Whether the Paying Bank within Dhaka City: The cheques clearing section of Al-Arafah Islami Bank Ltd., Dhanmondi Branch sends Inter Branch Debit Advice (IBDA) to the head office on the receiving day of the instruments. The main branch takes those instruments to the clearing house on the following day. If the instruments are dishonored, Head Office of Al-Arafah Islami Bank Ltd. sends IBDA to the Al-Arafah Islami Bank Ltd., Dhanmond Branch. Whether the Paying Bank of their own branch: The cheque clearing section of Al-Arafah Islami Bank Ltd., Dhanmond Branch sends Outward Bills for Collection (OBC) to the concerned paying branch to get Inter Branch Credit Advice (IBCA) from the paying branch. If the paying branch dishonors the instrument, the paying branch returns it to the Al-Arafah Islami Bank Ltd., Dhanmond Branch describing why the instrument is dishonored. Local Bills Collection Cheques (LBC): Local bills collection cheques are those cheques, which are collected and paid by two different branches of a bank situated in the same city. Outward Bills Collection Cheque (OBC): OBC cheques are those cheques, which are collected and paid by two different branches of same or different bank situated in the outstation. Transfer Cheque: Transfer Cheques are those cheques, which are collected and paid by the same branch of Al-Arafah Islami Bank Ltd.
Clearing house is an arrangement under which member banks agree to meet, through their representatives, at an appointed time and place to deliver instruments drawn on the other and in exchange, to receive instruments drawn on them. The net amount payable or receivable as the case may be, is settled through an account kept with the controlling bank. Outward Clearing: Outward clearing means when a particular branch receives instruments drawn on the other bank within the clearing zone and those instruments for collection through the clearing arrangement is considered ad outward clearing for that particular branch. Inward Clearing: When a particular branch receives instruments, which drawn on them and sent by other member bank for collection are treated as inward clearing. Sending money from one place to another through some charges is called remittance. To pa or receive money of customers in the form of remittance from one place to another, from one person to another inside and outside the national boundary is an earning source of every bank. Dhanmondi Branch, Al-Arafah Islami Bank Ltd. operates both the foreign and local remittance to serve it’s customers. In addition, this service is an important part of country’s payment system. Through this service, people can transfer their funds from one place to another place very quickly. Moneygram is a money transfer medium/agent serves both domestic & international services. Its identification number consists 12 digits. Eldorado is another money transfer agent serves only international services. Its identification number consists 17 digits. Pay order gives the payee the right to claim payment from the issuing bank. It is payment from issuing branch only within the clearing house area of issuing branch. Payment is made through clearing. Examine gentility of the pay order. Debit, if the fund is sufficient then it is OK for payment. Confirm that the DD is not forged one. 500/- is the minimum amount of initial deposit. The introducer must be attested photograph. The introducer must be account holder of Al-Arafah Islami Bank Ltd.
Al-Wadia Current Deposit Account facilitates the account holder to draw money at any times but no profit is given to the current account deposited money. This can be opened by any individual or joint or any name of proprietorship business, private limited company or public limited company, association, clubs, societies, trusts etc. Generally, current account is opened for businessman and traders for easy transaction. By taking this liability, Al-Arafah Islami Bank Ltd. takes a service charge of Tk. 100 for six months. 6% profit rate against STD. 1000/- is the minimum balance. Installment Term Deposit (ITD) is a sure investment for a steady return. It can be opened for 5, 8, 10, or 12 years for Tk. 200, Tk. 300, Tk. 500, Tk. 1000, Tk. 1500 and Tk 2000. The savings amount is to be deposited any day of the month. If the depositor has a separate account in the bank for which a standing instruction can be given to transfer the monthly deposit in the schemes’ account. Incase of failure to make the monthly installment in the schedule time 5% on overdue installment amount will be charged. The lowest charge will be Tk. 10 and this will be added with the following monthly installment. After 3 years of savings in this schemed the depositor is eligible for a loan up to 80% of his deposited amount. Mudaraba Lakhpoti Scheme: For Mudaraba Lakhpoti Scheme 3, 5, 8, 10, 12 year’s monthly installments are Tk. 2,375, Tk. 1,275, Tk. 670, Tk. 460 and Tk. 335 respectively and will get Tk. 1 lac. Mudaraba Millionaire Scheme: For Mudaraba Millionaire Scheme 3, 4, 5, 6, 7, 10, 12, 15 and 20 year’s monthly installments are Tk. 23,950, Tk. 16,950, Tk. 12,750, Tk. 9,950, Tk. 8,000, Tk. 4,600, Tk. 3,345, Tk. 2,170 and Tk. 1,150 respectively and will get Tk. 10 million. Mudaraba Kotipoti Scheme: This is the most popular & target oriented schemes. One can open for 3,4,5,6,7,10,12,15,18,20 years and have to pay (monthly installment) Tk. 2,39,500, Tk. 1,69,500, Tk. 1,27,500, Tk. 99,500, Tk. 80,000, Tk. 46,000, Tk. 33,450, Tk. 21,485, Tk. 14,330 and Tk. 11,100 respectively and will get Tk. 1 crore. By filling up a form an account is opened. A non-transferable deposit receipt will provide to the customer after opening the account. If the deposit is withdrawn before a 5-year term, then saving interest rate will be applicable and paid to the depositor. However, no in profit paid if the deposit is withdrawn within 1 year of opening the account and Monthly Income paid to the customer will be adjusted from the principal amount. This scheme will be credited to the loan account until liquidation of the loan amount inclusive of profit. A depositor can avail loan up to 80% of the deposit amount under this scheme. Mudaraba Double Deposit Scheme: Savings works as the very foundation of development. Savings is the prime source of business investment in a country. So it helps to build up capital. To create more awareness and motivate people to save, Al-Arafah Islami Bank Ltd. offers Mudaraba Double Deposit Scheme. Here people put their money for double return after 6years. The deposit can be made in multiplies of TK. 10000.00. This is 6 years period deposit. The deposit cannot be withdrawn at any time with in the maturity date. In this bank, Bai-Muajjal is treated as a contract between the bank and the client under which the bank sells to the client certain specified goods, purchased as per order and specification of the client at an agreed price payable within a fixed future date in lump sum or by fixed installments. “Working Capital” when the customer is an industry. Bai-Murabaha may be defined as a contract between a buyer and a seller under which the seller sells certain specific goods (permissible under Islamic Shariah and the Law of the land), to the buyer at a cost plus agreed profit payable in cash or on any fixed future date in lump-sum or by instalments. The profit marked-up may be fixed in lump-sum or in percentage of the cost price of the goods. This is a sale contract between a buyer and a seller under which the ownership of certain goods or asset is transferred by seller to the buyer against agreed upon price paid/to be paid. Thus, in Hire Purchase under Shirkatul Milk mode both the Bank and the Client supply equity in equal or unequal proportion for purchase of an asset like land, building, machinery, transports etc. Purchase the asset with that equity money, own the same jointly; share the benefit as per agreement and bear the loss in proportion to their respective equity. The share, part or portion of the asset owned by the Bank is hired out to the Client partner for a fixed rent per unit of time for a fixed period. Lastly the Bank sells and transfers the ownership of its share / part / portion to the Client against payment of price fixed for that part either gradually part by part or in lump sum within the hire period or after the expiry of the hire agreement. The bank shall provide suitable investment services & products for the following sectors, which must meet the other requisites as set by the bank from time to time. Every year at the time of investment budgeting a clear indication of banks appetite for growth to be reflected approved investment budget shall be strictly followed for the development of the bank. As initiated by Bangladesh bank vide BCD circular no. 33 dated 16-11-89 different kinds of lending were subdivided into 11 categories w. e. f 01-01-90, which was subsequently reduced to 9 vide BCD circular no. 23 dated 09-10-93 and again to 7 prime sectors vide BCD circular no. 8 dated 25-04-94 for fixation of rates of profit by the individual banks on competitive basis depending on the cost of funds, prevailing market condition and monetary policy of the country. Bank may allow investment facilities to a single customer/Group (Funded & non funded) up to its 50% of total capital out of which funded facilities must not exceed 25% of total capital. All proposal submitted to Head Office will also be required to indicate the extent of the Bank’s global exposure to that customer group. Investment facility in the name of the borrower. Investment facility in the name of the firms & companies in which the borrower or its partner or its director is the proprietor or a partner or a Director. Investment facility in the name of any firm of company in which the borrower or its partner or its director owns 20% or more share even if not a Director. Any Investment facility guaranteed by the borrower or its partner, or its Director. The Banks should outline industries or leading activities that are discouraged. As a minimum, the following should be discouraged. Logging, Mineral Extraction/Mining, or other activity that is ethically of environmentally sensitive. Counter parties in countries subject to UN sanctions. Bridge Investments relying on equity/debt issuance as a source of repayment. Izara Bill Baia (HB-residential) who has no other business with the bank. The amount and scope of each Officer lending authority is a function of the amount and extent of authority required by the officer to carry out his/her responsibilities to the Bank and its clients may prudent, effective manner. It must be emphasized mat an Officer will not be delegated lending authority only on the basis of his position. In other words, an officer does not automatically get lending authority by virtue of his corporate and/ or functional title. Specified lending authority will be delegated by the Managing Director to various Executives after taking into consideration his proven credit judgment, knowledge and experience. The amount of lending authority approved by the Board for various Executives form the upper limits of the authority that may be delegated to an officer holding corporate title. Each individual lending authority will be delegated to him in writing. The managing Director with the Executive Committee/ Board will review all lending authorities periodically. Bangladesh Bank has established within itself a Credit Information Bureau (CIB), which collects credit information from the banks. Banks are required to furnish such information in respect of credit limit of Tk.50000 and over. They mention the Name of facility, security and charge along with outstanding balance. After consolidating such information in respect of each customer the central bank supplies to the total limits sanctioned to and the number of banks dealing with a party. Thus the banks can find out if any of their customers is having excessive borrowings from the banking system at any particular time. This chapter is the most vital part of an internship report. It focuses and explains the things I have learned and acquired from the internship period, performance of Dhanmondi branch and specially at that particular period, the profit growth of the overall bank, manpower management system of the branch, marketing strategy of the bank relating to its mission, vision and commitments, SWOT analysis etc. Dhanmondi branch of Al-arafah Islami BankLtd. is running well to the goals of their philosophy. Though it has shown some cyclical variation in various years but its deposit collection, investment, export & import activities and above all the ultimate target is showing that Dhanmondi branch perform its management expectation satisfactorily. Performance of Dhanmondi Branch, Al-arafah Islami Bank Ltd. The Dhanmondi branch’s deposit collection rate is quite well such as in 2007 and 2008. It collected Tk. 1024.80 ml. and Tk. 1235.70 ml. respectively although management targeted Tk.1500 ml. for both the years. The percentage of achievement was good in 2008 but it could not achieve its target in 2007 because for the economic recession and many other reasons. The Dhanmondi branch’s investment response rate is quite well such as in 2007 and 2008. It collected Tk. 211.10 ml. and Tk. 213.26 ml. respectively although management targeted Tk.500 ml. for both the years. But it could not achieve its target in 2007 and 2008 because for the economic recession and many other reasons. The main strategy of the bank is using Islami Banking System to attract its market. Providing high quality financial services in export and import trade. Taking less promotional activities and emphasizing on relationship marketing. In the Dhanmondi Branch, Al-arafah Islami Bank Ltd. I have many things and got practical experience about general banking and investment sector. Here I learned how to issue a cheque to an account holder. Thus, I learn how to open current account and saving account, required documents and papers for different types of account. I did work with clearing department where I have learned how to clear the cheques through clearing house of Bangladesh Bank, OBC etc. I have also acquired the knowledge of different types of investment operated in Dhanmondi Branch. From the investment sector I know about the legal requirements, documents and papers for different types of investment schemes. At the end, I would like to say that in my internship period; I have learned official manners, corporate environment and behaviour, customer service, how to deal with customer and earned satisfaction. Not surprisingly, in the competitive arena of marketing era SWOT analysis is a must based on Product, Price, Place and Promotion of a financial institute like private bank. From the SWOT analysis we can figure out ongoing scenario of the bank. So to have a better view of the present banking practices of Al-Arafah Islami Bank Ltd.
Islami Shariah based banking system. Energetic as well as smart work force. Competitive profit provider comparing with other Islamic bank. Lack of consumer credit scheme. Marketing policy is not well setup. Many inexpert and laggard assistant officers. Insufficient number of deposit scheme and loan. Introducing branch banking through online. Develop relations and correspondence with foreign banks. More concentrated Banking based on Islamic Shariah. Competitors have more attractive deposit schemes. Bangladesh Bank has no well established Islami Banking Rules. Different classic services of other banks. Entrance of new private commercial banks. Young, energetic, dynamic, talent and smart work force of competitors. imposes high rate of taxes and VAT. Political unrest and economic recession. Illegal business operation by the some clients. Islamic banking is now a reality in Bangladesh. It is functioning efficiently, smoothly and satisfactorily despite facing various internal and external threats. The economics of the country may be geared towards Islamic Principles and Teachings in order to realize the full potential of Islamic banks in the long run. However, in the short run, the Islamic banks can take a number of concrete steps to facilitate the Islamic banking in Bangladesh. This report will give a clear idea about the activities, function and operational strategies of Al-Arafah Islami Bank Limited. Al-Arafah Islami Bank Ltd. started its journey in 1995 with the said principles in mind and to introduce a modern banking system based on Al-Quran and Sunnah. During these 13 years of its operation, the bank had been widely acclaimed by the business community from small businesspersons to conglomerates for forward looking outlook and innovative financial solutions. The Dhanmondi Branch, of Al-Arafah Islami Bank Ltd. conducts general banking activities, investments. As it is a non-ad branch, it does not perform the full of the foreign exchange activities by its own. The fund of bank strongly depends on deposits and it is has a big influence through the number and amount of deposit. Dhanmondi Branch, Al-arfah Islami Bank Ltd. has a better opportunity to have a huge deposit accounts to increase it fund from the savers unit Rayer Bazar, Zigatola and Hagaribagh. Credit card and ATM cards can play an important role in capturing the unutilized money. The bank has to give huge concentration on better customer service and satisfaction. There are a good number of shoping mall, food courts, small & medium factories in the area. So the branch can gladly introduce SME banking L/C and foreign exchange facilities. Through my work experience at the Dhanmondi Branch, Al-arafah Islami Bank Ltd., I came across a few operational drawbacks – for which the following suggestions can be put forward. More employees should be appointed to manage the increasing customer pressure. The behaviour of security guards must be improved. I have experienced some unwanted incidents that occurred through the carelessness of the guards. Sometimes clients also complain about their misbehaviour. Leaflets containing AIBL’s product description should be made available at the branches. This will help the prospective customers to be informed about existing and new products, and reduce the hassle of counter staffs to describe new products. This will eventually result in increased employee productivity. Individual counters to provide one-stop service for cheque payments. More social involvement by AIBL such as providing student scholarship, creating more employment opportunities, rehabilitating the poor. If the stated recommendations are carried out and the government pays attention to the policy framework of the entire system, then that day would not be far when Bangladesh can proudly focus more on the Islamic banking system than the conventional banking system.